"While the data indicates the number of legislative seats held nationally by women has remained stagnant, Libby Kimzey, the former head of Rhode Islanders for Fair Elections, an organization that since 2006 has been pushing for public financing of all state elections, still supports the concept. Kimzey is now campaign manager for Teresa Tanzi, a former chair with the Rhode Island National Organization for Women and proponent of public financing. Kimzey bluntly says money does affect Tanzi’s ability to compete with R.I. State Rep. David Caprio, an established incumbent. “I believe (public financing) is a crucial gateway to a better representative democracy,” Kimzey says, “Teresa and I share the conviction that money alone shouldn’t determine an election.”"
Consider the revelations of each quarter's filing reports: in the State Treasurer's race, in the Attorney General's race. Too often in politics, on the state and national level, the candidates we support weaken or drop out entirely because they don't have the deep pockets of their opponents. 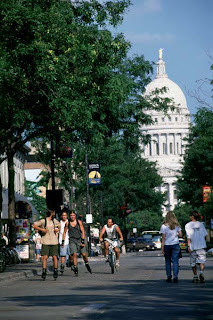 The homogeneity of our state legislature is a poor reflection of the diversity of our state, and having the full range of perspectives involved in the decision-making process would give the citizens better public policy. In the ProJo editorial pages, there is a constant refrain: 'the General Assembly is corrupt, lazy, and dominated by special interest groups.' What the Progressives, the Moderates and the Conservatives share is an interest in having new voices heard on the State House floor. Entangled with power of money is power of name, a problem magnified in Rhode Island where everyone knows everyone, and half of those share last names. One need look no further than the current slate of gubernatorial candidates to understand the difficulty in establishing new players as worthwhile candidates with worthy ideas. Down in South County's District 34, with an early start, hard work and passionate grassroots support, the Tanzi campaign has raised over $11,000, positioning her as a strong candidate. However, the incumbent could spend an absolute minimum of his time and energy fund-raising, then simply cut a check to his campaign. According to his campaign finance reports, he already has $40,000 in loans outstanding. In the continued absence of a public financing system for state legislative seats, we need your help to bring the choice to the voters on September 14. 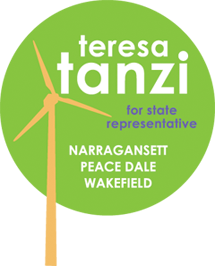 Today, you can support a public advocate of voter-owned elections, progressive community leader Teresa Tanzi. Please Donate to Help Elect a Grassroots Candidate who will proudly represent South County!